Today, for many of us, adults make up a significant portion of our patient base. Many of these adults have had treatment before and remember their experience as painful, cumbersome and time consuming. If your practice is anything like mine, adult patients are often looking for faster treatment, fewer appointments and an aesthetic option that is far more advanced than what they remember from their childhood. Our adult patients are living busy lives—with families to care for, full-time jobs and laundry lists of to-do items—but, more and more, health and beauty are becoming high priorities. This particular case is one of my favorites because I was treating the patient’s son when she asked if I’d be willing to look at her teeth, smile and bite. She had seen what self-ligating brackets did for her children—who I treated with the Damon System—and she was eager to have a broader, full smile. 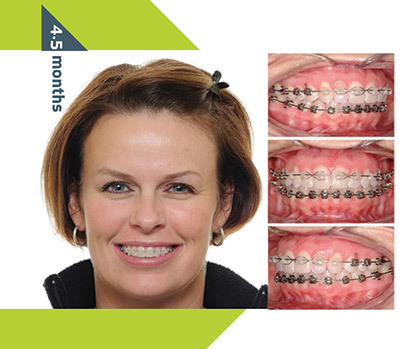 She thought aligner treatment was the best choice for her— discreet for her work and social life and easy to manage. What she didn’t realize was aligners would eliminate her crowding, but wouldn’t satisfy her desire to have a full smile like her children’s. She was ecstatic when I told her we had a Damon System treatment option with clear brackets. As aligner treatment gains popularity, this is a common situation we all face. The following outlines how I went about treating this case in 35 weeks with clear self-ligating brackets, resulting in a happy patient with a beautiful smile. Class I (end-to-end Class II molar on right), female patient, 38 years old, came inquiring about clear aligner treatment. She had orthodontic treatment by another clinician years before. I had treated both of her children with the Damon System and she had been pleased with the results. 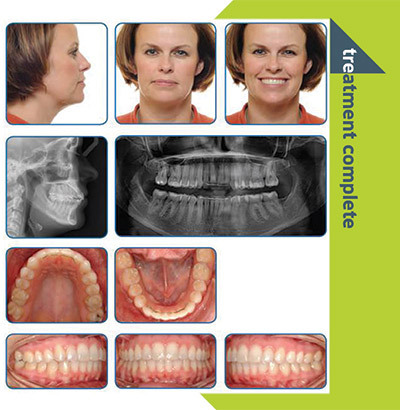 Given that her chief concerns were the crowding in her lower arch and the widening of her smile, it was clear to me that aligner treatment wasn’t her best option. I talked candidly with her about how passive self-ligation would offer her the results she wanted and could satisfy her need for an aesthetic option with Damon Clear. Mildly convex profile with a mildly convex nasolabial angle. Slight lip strain when lips were at rest with lower midline shifted to the right. Slight gingival display in the maxilla, narrow arches with 3 to 4mm of crowding in the lower arch and 1 to 2mm of crowding in the upper arch. Consonant smile arc. Aesthetically-shaped teeth in both arches and excellent hygiene. Inconsistent gingival architecture in the lower anteriors and upper R3. Desire for discrete treatment option. Treat non-extraction, eliminating the crowding by widening the arches using the Damon Clear brackets U3-3 and Damon Q elsewhere. Employ variable torque to foster the proper inclinations in the anterior teeth and maintain the smile arc. U/L: Direct-bonded 7-7, engaging .014 round Damon Optimal Force Copper Ni-Ti1 archwires from 6-6 upper and 5-5 lower. U: Placed a stop between U/L 1s. U: Transitioned to a .014 x .025 CuNi-Ti archwire. Ligature-tied U2-2. Added a stop MD to UL1. L: Transitioned to a .018 round CuNi-Ti archwire. Added stop between lower 1s. U/L: Started Quail, 3/16”, 2oz., Shorty CL II elastics (right side only L6 to U4, full-time), maintaining them throughout treatment. U: Transitioned to a .018 x .025 CuNi-Ti archwire. Maintained ligature ties U2-2. Stops were placed M-D to UL1 keeping 1mm of space on either side of the bracket with the stops. L: Transitioned to a .014 x .025 CuNi-Ti archwire. Ligature-tied L3-3, maintaining it throughout treatment. One stop placed between the lower 1s. U/L: Maintained Shorty CL II right elastics. U: Repositioned the UR3 and dropped the wire size to a .014 x .025 CuNi-Ti archwire. Maintained ligature ties U2-2 and moved stops mesial and distal to UR1. L: Maintained the .014 x .025 CuNi-Ti archwire and ligature ties L3-3. U: Transitioned to a .018 x .025 CuNi-Ti archwire and maintained ligature ties U2-2. U: Maintained the .018 x .025 CuNi-Ti archwire. Ligature-tied U3-3. U/L: Took interim panograph and repositioned UR4, LR1 and LR3. The repositioning was minor and did not require wire dimension reduction. U/L: full CL II right with parrot 5/16 2oz elastics. U: Transitioned to a .019 x .025 TMA archwire, adding 15° of buccal crown torque to the UL3, maintaining ligature ties U3-3. L: Transitioned to a .017 x .025 TMA archwire and put a step-up bend in the LR4. Maintained ligature ties L3-3. U/L: Class II right parrot but transitioned to nighttime only. U: Maintained the .019 x .025 TMA archwire, putting a step-down bend UL1. Maintained ligature ties U3-3. L: Maintained the .017 x .025 TMA archwire and ligature ties L3-3. U/L: Maintained CL II right elastics at night time. U/L: Removed all appliances. Shaped and polished the teeth. 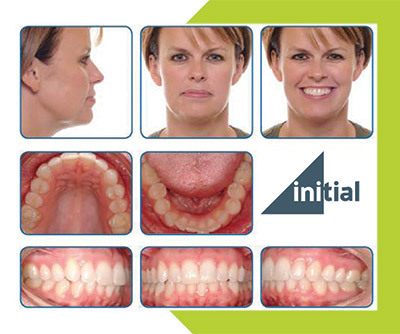 Took impressions for 1mm Essix-formed clear overlay U/L retainers. Bonded permanent retainer U2-2, just on the 2s, starting at the UR2, shaping the wire tooth by tooth using .016 x .022 Bond-a-Braid lingual retainer wire. Bonded lower retainer, every tooth, L3-3 using a .026 stainless steel wire, forming looping bends on each end. The lower fixed retainer is to be bonded for life. If the upper fixed retainer comes loose after 18 months, we rebond it if the patient originally had 3-4mm or more of spacing pretreatment. Two weeks later, took final records and delivered clear retainers. In this case and others, I began experimenting with using a Trilene fishing line rather than ligature wire to keep space closed while transitioning to a rectangular wire. It has proven to originally inquired about clear aligner treatment, the fee would have been substantially more and would not have allowed us to reach her objectives. 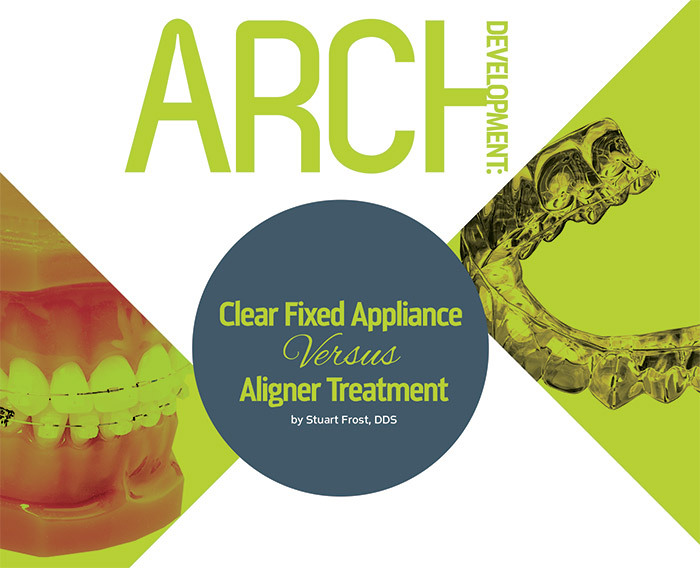 While clear aligner treatment can satisfy the goals of certain adult cases, aesthetic fixed appliances allow us to achieve outstanding results due to the added control and ability to continually adjust treatment mechanics to fit the patient’s changing needs. Today, Damon Clear, which is what I use in my practice, is available in the uppers and lowers and the newly introduced Damon Clear2 has two times the rotational control for added precision and treatment efficiency. I am a firm believer that there is always room to grow and learn from every case. This case is no exception. In looking back, the patient had a lateral tongue thrust at the UR3, which plagued me throughout treatment. If I were to treat the case today, I would place lingual tongue reminders in the LR/UR3 that would likely have resulted in a more satisfactory Class I right cuspid relationship. I encourage all clinicians to strive for perfection, but take time to critically review each case to honestly assess what you’d do differently given the opportunity—often it’s the best way to learn. To see this patient’s testimonial, visit: http://www.youtube.com/watch?v=65QQ9RA_21U. Dr. Stuart Frost is a native of Arizona and comes from a family of dentists. He graduated with honors from the University of the Pacific School of Dentistry in 1992. He then practiced general dentistry in Phoenix and Mesa until 1997. In 1997, Dr. Frost completed a one-year fellowship for Temporomandibular Joint Dysfunctions at the University of Rochester in upstate New York. He continued his education there and completed a two-year residency in orthodontics and dentofacial orthopedics. Dr. Frost is dedicated to the advancement of the orthodontic profession. He is a Damon System Mentor to many orthodontists around the country. He is an associate professor at the University of the Pacific School of Orthodontics where he educates and trains residents about the Damon System. He was invited to participate on a board of orthodontists who created the curriculum for Damon self-ligation that is used in dental and orthodontic programs nationwide. Dr. Frost is a member of the Ormco Insiders Group, Progressive Study Club, Damon Phoenix Study Club, AAO, PCSO, ADA and AZDA.